(Newser) – A New York City firefighter responding to a car accident in Brooklyn fell from an overpass and died at a hospital, reports the AP. In a statement on the FDNY's Facebook page Monday morning, Fire Commissioner Daniel Nigro and Mayor Bill de Blasio identified the probationary firefighter as Steven H. Pollard. "It's an incredibly sad night for the Pollard family, for the Fire Department family, and for our city," Nigro said. "He lost his life tonight in the process of helping others." Ladder Company 170 in Brooklyn was called to the two-car accident with injuries on the Belt Parkway around 10pm Sunday, Nigro said. As the firefighters were going to help the victims, Pollard slipped through a gap in the roadway and fell about 52 feet to the ground. He was pronounced dead at Kings County Hospital. 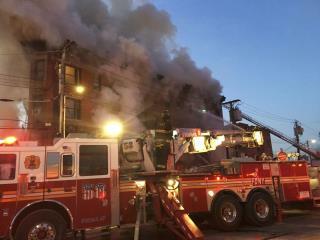 Pollard is the 1,151st member of the FDNY to die in the line of duty, the statement said. He comes from a family of firefighters, including his father, Ray Pollard, of Ladder 102 in Brooklyn, and his brother Ray Pollard Jr., who's a member of Ladder Company 114. Survivors also include his mother. Police Commissioner James O'Neill tweeted early Monday that his department sends its condolences to the family, friends, and colleagues of the firefighter who fell Sunday night. "#NYC will never forget your sacrifice," the tweet read. De Blasio and O'Neill went to the hospital after the accident. "This is a family who has done so much for New York City and now they're going through this loss and this pain," de Blasio said. "It's a very, very tough situation." NYC intelligence at work for the masses. No matter what they do, they are still going to have that gap and major sh*thole in between the FDR and 9a.